Nick Wapner heard the sound of crunching fiberglass echo through the Pacific Ocean. His head was just above the surface, and his legs were inside the mouth of a shark. 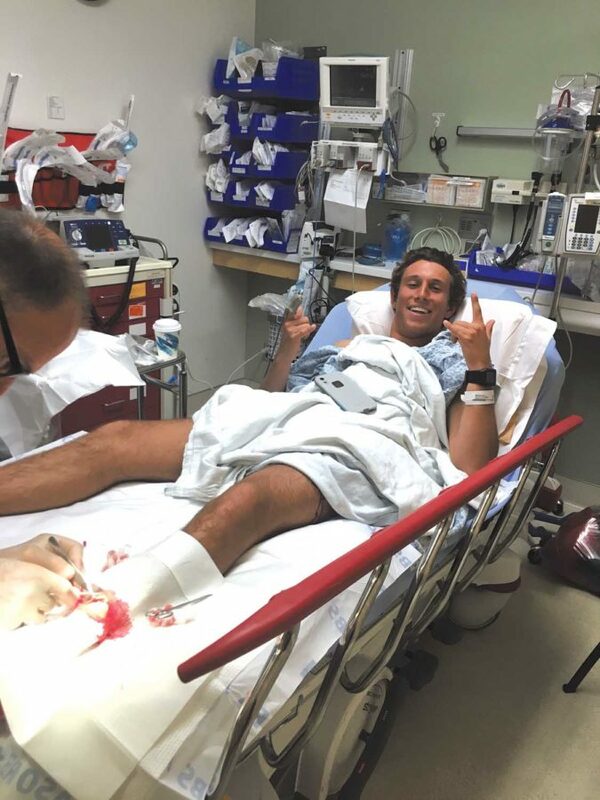 On Jan. 8, the Palos Verdes Estates native was surfing Montaña de Oro State Park, near Morro Bay when he was attacked by what is believed to be a 15-foot great white shark. He sustained deep lacerations to both legs that required 50 stitches from the emergency room, but is expected to make a full recovery. Wapner is a second-year student at Cal Poly San Luis Obispo, and was squeezing in a between-class session with friends when the incident happened. He didn’t see the shark before it knocked him off his board and into the air. His feet and legs got in its mouth when he landed. “I turned around and the thing was backing off, kind of letting go. One of my legs got free, and I turned and kicked it. I kicked it three times, and I sort of pushed off it and stroked into a wave. I turned around, didn’t see it, and the wave just put me on the beach,” Wapner said in an interview. The attack came about an hour into his session, and followed his best ride of the day. Just one more wave, Wapner thought. It’s a refrain surfers often repeat to themselves as they ponder the end of a session, with all the feebleness of a drunk trying to leave a bar. Jan. 8 was a down day for that corner of the Central Coast. Weeks of relentless storms in the Pacific Ocean have provided the longest stretch of good waves in years for California surfers. But that grey Tuesday fell in between a fading swell, and the arrival of an even larger one. Wapner and friends headed to Montaña de Oro State Park, a bit south of the massive Morro Rock, in hopes of a catching a few waves. “The surf was kind of backing off, and sometimes there are more waves there,” Wapner said. He also now has etched in his mind that the closest hospital is a 30- to 40-minute drive. When he got to the beach, he stood up and told his friends what happened. They were farther up the beach, and realized the seriousness of the situation as he got closer. They could see blood “oozing” out of his wetsuit. Wapner and his friend Max walked toward the car, while the others flagged down the last of their party to leave the water. “Max’s at light speed taking his wetsuit off. He threw it in the back of his car, drove me in my car. Two other kids drove behind us to the hospital,” Wapner said. Wapner is an experienced waterman, but growing up in Southern California he did not have a lot of experience with sharks. He became a State beach lifeguard at 16 and worked summers in Huntington. He often saw sharks there, but said that they were usually juveniles, rarely more than five feet long. Steve Gherardi coached Wapner on the surf team at Palos Verdes High School. He recalled Wapner as one of the better surfers on the team during his years with the Sea Kings. Gherardi said that in competitions and practices at Torrance Beach the team occasionally came across tiny leopard sharks, and said the first sizable one he’s encountered has been within the last year. “I guess they’re becoming more prevalent. The ocean’s really come back to life in my lifetime. I’ve never seen so many whales and dolphins. They’re catching bluefin [tuna] off Point Fermin,” Gherardi said. Shark attacks remain extremely rare in California. But although the rise of social media has probably made surfers more aware of sightings — nothing lights up Instagram like a shark shimmying beneath a stand-up paddleboard — scientists agree that sharks are popping up more frequently in Southern California, with a cleaner environment and fishing regulations to thank (or blame). Sharks have long been more common north of Point Concepcion, but even there they are attracting interest. Dr. Chris Lowe, director of the Shark Lab at Long Beach State University, testified before the California State Assembly last year in support of a bill that would allocate funds to study concentrations of sharks off San Luis Obispo County. “We know white sharks are moving more when they get larger, but we really know very little about their movements along the southern Central Coast, the area from Point Concepcion up to Morro Bay,” Lowe told the San Luis Obispo Tribune last year. En route to the emergency room, Wapner called his dad, a fellow surfer. At first, his dad thought he was joking. But when he realized his son was serious, he provided a bit of sound medical advice. “I had a yellow towel wrapped around my legs. He told me ‘Keep pressure on the wound and keep your legs up on the dashboard. You’ll be fine,’” Wapner said. Once at the emergency room, Wapner found himself in good hands. “The surfing doctors were on duty. They pulled off my wetsuit instead of cutting it off. They know how expensive those things are,” he said. Based on the placement of wounds, doctors estimated that the shark’s mouth was 30 inches wide, which is consistent with Wapner’s description of the fish’s size. “I drive a Suburban. That’s a fairly large car. I didn’t see all of [the shark], but it was about the size of my car,” he said. News of the attack quickly spread to Palos Verdes. Gherardi said that he was “engulfed with text messages” after the incident happened, including one from Wapner and Wapner’s father, with whom Gherardi regularly surfs. Wapner’s younger sister Gabrielle is currently on the surf team, and competed the Friday after the attack. Wapner returned to class on Jan. 15. He still has a bit of numbness on the top his right foot, from a nerve the shark bit into near his ankle, but has been getting feeling back up from his toes bit by bit. Once his stitches are removed and he is cleared of any infection, he plans to return to the waves.